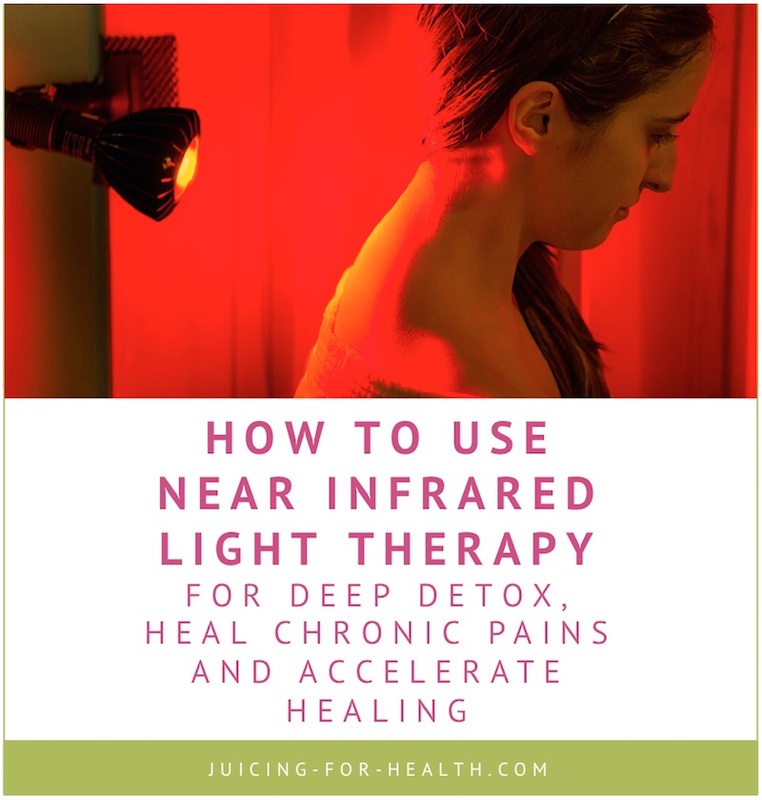 My first experience with near infrared light therapy was more than two decades ago, after giving birth to my first child, naturally. At the hospital bed, a nurse was shining an infrared lamp to my stitches to speed up healing. Within two days, the wound had healed nicely and I was discharged. As you might be aware, hospitals use infrared heating lamps to warm newborn babies. Infrared light is unlike exposing yourself to harmful UV rays from the sun or a tanning bed. With infrared light, there is a soothing feeling, you cannot burn yourself with infrared heat, nor are there any known dangers in using infrared heat in your sauna. FIR saunas use heating elements that mainly emit light in the far infrared range that do not penetrate the body as well as NIR. FIR can penetrate the surface of the skin for detoxification, whereas NIR can penetrate much deeper into the skin for deeper detoxification and healing. In fact a NASA study shows that NIR light penetrates up to 23cm (9in) of body tissue. The main benefit of FIR sauna is the heat, but why settle for just the heat when you can also benefit from the deep healing properties of NIR? 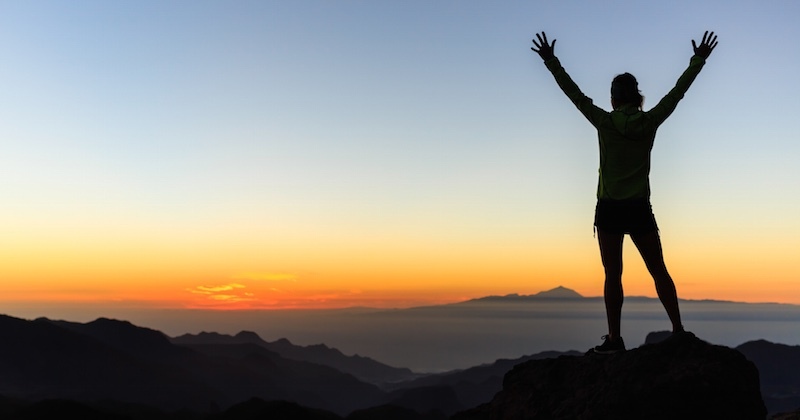 NIR mimics the morning sunlight and provides your body what Nature intents. Morning sunlight is calming to the body, mind and soul, does not hurt the eyes, provides your body with natural vitamin D, thus reducing inflammation. Just as during winter, without sufficient sunlight, people fall into depression, now known as the seasonal affective disorder (SAD) syndrome. When it comes to EMF emissions, FIR saunas emit a higher level that is harmful to the body with regular use. NIR emits very low to almost zero EMF (electromagnetic fields). Most wavelengths of light (blue, green, ultraviolet) do not penetrate the skin at all but instead are just absorbed by the outer layers of our skin. However, red light and near infrared light not only are able to penetrate through the skin, they are also able to induce significant physiological changes inside the tissue. Red light therapy has shown positive effects on energy metabolism and inflammation reduction in various studies. Different ailments have been studied with success, especially for treating body parts such as the glands, joints, muscles, organs and even the brain! Near infrared light therapy uses infrared wavelengths to deliver energy into cells, stimulating healing and relieving inflammation. It penetrates deeper below the skin into tissues to not only relieve pains, but when used therapeutically, in many cases is able to even completely heal the source of the pain. On the other hand, mid to far infrared light with wavelengths of above 1150 nm gets absorbed by water molecules in the air, on and under your skin, leaving very little that can be of cellular use except heat. How Does Near Infrared Light Therapy Work? Near infrared light therapy is also known by many other terms such as photobiomodulation (PBM), low-level (laser) light therapy (LLLT), red light therapy, photobiology, and mitochondrial stimulation. Near infrared light therapy produces low heat, invisible energy that penetrates through the skin, and are absorbed by photoreceptors in each of our cells into the mitochondria to power up production of more ATP (adenosine triphosphate), a compound that provides the cell’s energy. When ATP production increases, your energy level increases. It is like your body cells are turbocharged to speed up healing of tissues. Stimulating the cell mitochondria with this infrared wavelength induces cell regeneration, improved metabolism, collagen synthesis, human growth hormone, neuron repair, wound healing, inflammation reduction and many more benefits! FAR infrared light cannot boast of these healing properties as the wavelengths are not able to penetrate the skin deep enough to what near infrared light can do. Although near infrared light produces low heat, it is able to induce healthy perspiration—sweating out toxic chemicals that are stored in tissues. Even if you initially don’t perspire, it doesn’t mean that the light isn’t working. It may take a few sessions before your pores are unclogged, and then you will start to sweat. Sweating is a natural antimicrobial action and plays a role to force out harmful microbes, toxins, dead cells, and pathogens to keep your blood clean and free from infections. Since your skin is the largest elimination organ in your body, it makes sense that with clean pores, your body is able to eliminate toxins better. As the light penetrates deep into the skin and beyond, it also improves blood circulation that draws out hidden heavy metals for elimination. Various clinical studies show that heavy metals such as arsenic, cadmium, copper, lead and mercury get excreted through the skin better than in urine. Other studies show that concentration of phthalate and BPA are found in high levels in sweat rather than in urine or blood. One of the first things you will notice from using whole-body near infrared light therapy in a sauna, is how good and light you feel. With regular therapeutic use, you can expect your immune system to be strengthened and chronic pains will improve and gradually disappear. Body temperature—stimulates production of white blood cells, your defence system. Near infrared light therapy is an excellent and approved medical device for healing of various wounds—cuts, scrapes, burns, bed sores, ulcers, infections and also skin breakouts. It increases circulation to the area where the red light is used on. When circulation is increased, your blood cells can better distribute oxygen and nutrients needed to heal the wound or injury. As it also helps to kill harmful bacteria and remove dead/damaged cells, infections can be prevented. New connective tissues and capillaries are then formed on the surfaces of wounds to accelerate healing and reduce scarring. NIR sauna promotes healthy sweating that helps dislodge toxins hidden under the skin and in tissues, for elimination. With improved circulation, you can get more oxygen and nutrients to your skin cells. Poor and blemished complexions are indications of toxins in your organs, and under the skin. Detoxification of toxins will eventually help improve the appearance of your skin. When you use body lotions or creams, these chemicals clog the skin pores. Sweating from using the near infrared light therapy will help you clear out your pores. As your skin is the largest elimination organ in your body, it makes sense that with clean pores, your body is able to eliminate toxins better. This also helps your skin to rejuvenate and glow. Studies suggest that there is pro-collagen synthesis, increase in local blood flow and tissue inflammation relief with the use of red light therapy. Clinical studies report that NIR therapy possibly contributes to the improved appearance of cellulite. Finally, what is exciting with the usage of NIR therapy, is its assistance in the natural production of collagen and elastin that prevents wrinkles. It also stabilizes and regulates surface skin pH levels and retains natural moisture to keep skin supple, soft and wrinkle-free. Near infrared light therapy has been shown to reduce muscle fatigue and improve muscle recovery. In athletes, it helps to increase metabolism, improve heart rate and boost/sustain stamina. Penetrating NIR light was found to relieve low back pain in patients. The light therapy increases the release of anti-inflammatory compounds and endorphins—our natural painkiller hormones, thus reducing pain. Hand-held or portable NIR devices are perfect for targeting localized physical injuries. Infrared and red light have been used clinically for the treatment of arthritis for decades. Near infrared light therapy is regarded not only as a reliable treatment for inflammation in arthritis patients, but actually is a healing tool for patients of osteoarthritis, rheumatoid arthritis and various inflammatory joint issues. Pain relief and accelerated healing are the well-proven hallmarks of red light therapy, so it should come as no surprise that it is beneficial for stopping pain, inflammation and healing joint damages. When the infrared heat hits the targeted area, the warmth opens up the capillaries, improves circulation and helps remove toxins, thus enabling the joints, muscles and damaged tissue to begin healing. When your joints are warm, they automatically relax to reduce stiffness and loosen up, increasing flexibility. Applying castor oil on affected areas before using the NIR therapy will enhance your results. Most studies using NIR light on joints have shown significantly positive effects. Fingers, toes, hands and wrists appear to be the most easy to treat of all arthritic problems, probably due to their relatively small size and shallow depth where smaller doses of NIR light can easily penetrate. Other areas that have been treated are knees, shoulders, jaw, neck, back, elbows, and ankles/feet. NIR light therapy can be used to support the treatment of chest and nasal congestion. It helps reduce inflammation, swelling and clears mucus-clogged passages, enabling you to breathe easier. Directing the therapeutic heat on your sinuses, jaw and neck area for 10-15 minutes daily will help to bring about improvement in symptoms of sinusitis, or a cold. It does not just relieve your symptoms but with consistent use will actually heal your sinuses at a deep and powerful level. Raising body temperature and creating an “artificial hyperthermia environment” that mimics a low-grade fever. When you have a fever, it is your body naturally raising the body temperature to help fight an infection. The temperature stimulates production of white blood cells—your body’s defence system—to fight harmful microbes (bacteria, viruses, fungi, yeasts, parasites and mold). Hyperthermia therapy also helps kill abnormal cells such as tumors as they have poor tolerance for heat. Raising body temperature disables or kills cells that have been mutated by radiation or damaged by toxins. For an immediate start, you may like to get a portable NIR light that is approved as a medical device. It can be used to direct heat on affected areas to help with healing. 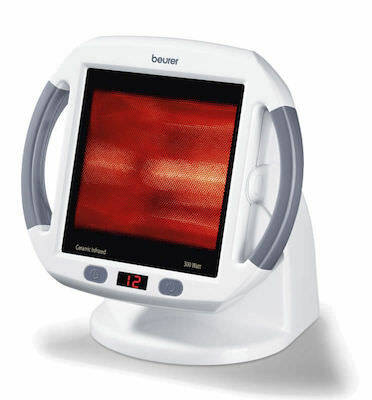 I found this Beurer Infrared Heat Lamp IL50 Light Therapy to be the most appropriate portable device that is easy to handle. “Solved my kidney problems in two sessions! My kidneys gone from bad to worse over the last six months. Started with heavily foaming urine due to the kidneys not being able to process protein and dumping it back in the blood supply. Then the fatigue set in causing me to want to sleep more and feel like I’m dragging myself through the days. This device is easily adjustable to direct the heat where you need. Keep a distance of about 12 to 16 inches between the lamp and your body. What I like about this device is that the heat is adjustable according to your health condition. It comes with a timer, and is equipped with a high-quality ceramic glass that ensures that the warmth emitted is safe and sufficiently intense, yet does not burn your skin. 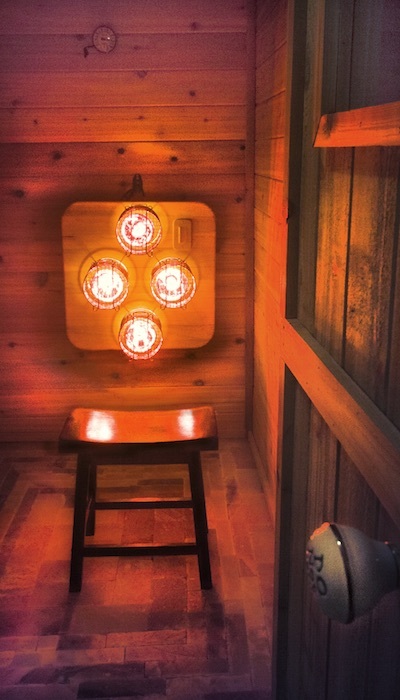 If you are a handy person, you can make a 3 or 4-lamp sauna like this. There are many similar videos online that you can look up if you want to build your own NIR sauna. I like this one as it is the simplest and neat, also easy to store away. You can make the switches that can turn on just one light or two, or all four, so that you can adjust the heat accordingly, when using it. There are also Philips Infrared Heat Lamps. I don’t recommend those as they are not meant for therapeutic use. Should you decide to build your own home NIR sauna, here is a guide on how to use it. Electrolytes: Make sure you are eating healthy when using the NIR therapy. If you tend to use the sauna daily, be sure to supplement with kelp. Kelp is rich in minerals, protein, the whole range of vitamins, folate, phytonutrients, small amounts of omega-3 fatty acids, and rich in iodine. Most importantly, it helps bind with toxic heavy metals to be expelled through perspiration. Beginner: Start with 10 minutes a day and gradually increase the duration up to 30 minutes for each session. Some individuals may feel giddy after the first session. This is due to the deep detoxification that is taking place. Get up and out of the sauna cautiously, and drink plenty of water. Relax: Don’t be tempted to be doing “something” when in the sauna. Leave your phone and other gadgets outside the sauna. Take this time to relax and focus on your body’s healing. Meditate or pray or simply practice deep breathing. Eyes: Unlike harmful ultraviolet rays, the red light will be soothing to your eyes. In fact, some studies show that NIR is helpful for optic nerve issues, macular degeneration and other eye problems. However, we suggest that you don’t stare directly into the light for long periods of time. Position: It is best if you are seated on a stool, about 18-20 inches away from the light. You should not be dressed where you want to direct the red light to allow direct penetration into your skin. Rotate every few minutes to get an even heat for the entire body. Who Should Not Use A NIR Sauna? Pregnant and nursing women should avoid using a NIR sauna, except in cases where a health condition needs to be treated. In which case, consult with your medical practitioner. Individuals with breast implants or have metallic pins or plates in the body should be cautious when using a NIR sauna. Begin with less time in the sauna and be alert to any internal heating sensations in the area of the metallic pins or plates. Using a NIR sauna is like basking in the morning sunlight and should not cause any alteration to individuals on medications. However, if you are concerned, please consult your physician before using. Pets should not be allowed into the sauna as they may not perspire as easily as humans, and may overheat in the sauna. To treat pets, use a single infrared heat lamp such as the one above, to treat the condition.